Our own great super moderator Bsbray conducted this interview.If this subject matter interests you then you are going to love this interview with one of the most reliable witnesses out there in the field of ufology.I would just like to thank Bsbray personally for this. Gary Heseltine is a UFO researcher and former British police officer who has catalogued more than 500 cases of UFO sightings by British police officers since 2002. He is also the founder of the UFO Truth magazine. In this interview for The One Truth Forum, Gary describes his research of past events and where he thinks we are headed with UFOs and disclosure of ETs in the years to come. what a great interview bsbray.I thought it was interesting how he retired early due to him feeling pushed and that his theory of Roswell and the development of the atomic weapons and when the first one was dropped it sent a shock wave into space so we got a visit from another race that went to Roswell because the first atomic squadron was located there.Gary thinks they were there observing the Atomic squadron that was based there.I did not know that that the first atomic squadron was based at Roswell. THANK YOU for an excellent interview with an excellent researcher ! wonderful interview - great job TOT and bsbray. All the above is all and only my opinion. It may contain some sharing of components of my current operating strategy and some foundational components of my current world view - all subject to change and not meant to be true for anyone else regardless of how I phrase it. Around that part, Sam, where Gary mentions the NRA, I think he might have meant the NRO (National Reconnaissance Office) but I'm not positive. The NRO definitely works closely with the military and NSA, and I believe they're the ones in charge of monitoring the Earth and space 24/7 with our satellite technology. This was great Bsbray! You did such a wonderful job, let Gary speak and you both come from a grounded position. I have some info on Rendlesham, as one of the volunteers of my retired racing greyhound group was the decoder on the case. He did all the binary translations and I've been privy to some information not released. It's very interesting. If I could I would release it but it's a waiting game. It has (still fairly recently) leaked out from an official source — but most Belgian citizens had of course already long been suspecting it — that the USAF has nuclear weapons here in Belgium as part of Belgium's NATO commitments. Concretely, those nuclear weapons are said to be kept in a USAF enclave within a Belgian Air Force base. According to NATO regulations, that would technically make this USAF enclave into US American territory, even though it actually resides on Belgian soil. However, this base — of which I know that there are nukes there — is located near Brussels, which is not where the triangular UFOs had been seen. The UFOs had been seen far more to the South-East, and did not come anywhere near Brussels during their "reconnaissance tour" — as I wrote in this post here, one of the craft had been reported by two Gendarmes as taking off from having landed somewhere in an open field. But yeah, a few years ago, our then Federal Minister of Defense, Pieter De Crem, blurted out in a political talk show on television that "Everybody knows that there are nuclear weapons stored in Kleine-Brogel." He was chastised in the press and by his colleagues later on for having admitted on the record to what everyone had already long known, and considering how he's a militarist and a big fan of the US government and US military operations, he probably will have slapped himself over the head afterwards as well. He wasn't exactly blowing the whistle. He merely had loose lips. Kleine-Brogel is the Belgian Air Force base near Brussels, and those nukes — or more precisely, they are aircraft-delivered and unguided nuclear bombs, so they are not missiles or "smart bombs" of any kind — had already been put there by the Americans somewhere in the late 1970s as part of NATO's Big Commie Scare™. I myself have served in the military — compulsory military duty, from late 1983 until late 1984 — and I already knew from back then that those nuclear bombs were there, and what the procedure to deploy them was. Furthermore, my brother has also served in compulsory military duty, and he was stationed at a NATO communications facility, where he was entrusted with the classifying of secret and top secret NATO documents pertaining to NBC (nuclear, biological and chemical warfare). Among other things, that's how he found out that AIDS and ebola had been weaponized. And in addition to that, I also still have a friend — he's the younger brother of an ex-fiancée, and he's also an ex-classmate of my brother's from middle school — who has himself also served in compulsory military duty, and he had in turn been stationed at Kleine-Brogel as a Belgian Air Force commando, and he used to hang out with the American airmen stationed there. At the time, the Belgian strike fighter jet was the F-16, but those nuclear bombs were actually mounted underneath two F-114 Starfighter jets belonging to the USAF. The F-114 was an already older plane — the F-16 was actually its successor within the Belgian Air Force — but the reason why they chose the F-114 Starfighter over the F-16 for delivering the nukes across the Russian border was that the F-114's range and top speed were ever so slightly better than those of the F-16 at the time — meanwhile the Belgian F-16 contingent has been upgraded, but that had not been the case yet when my brother and I were respectively putting in our military service. Both F-114s were also kept under scramble-ready conditions around the clock, their engines kept at an ideal operating temperature for an immediate take-off, their main and auxiliary tanks fully fuelled, and there were always two pilots on permanent standby, 24/7. Starfighters were beautiful planes, by the way. As a teenager, I built lots of model airplanes from kits — primarily jets — and one of them was an F-114 Starfighter. This is an F-114 in a two-seater configuration— presumably a training aircraft — belonging to the German Luftwaffe. 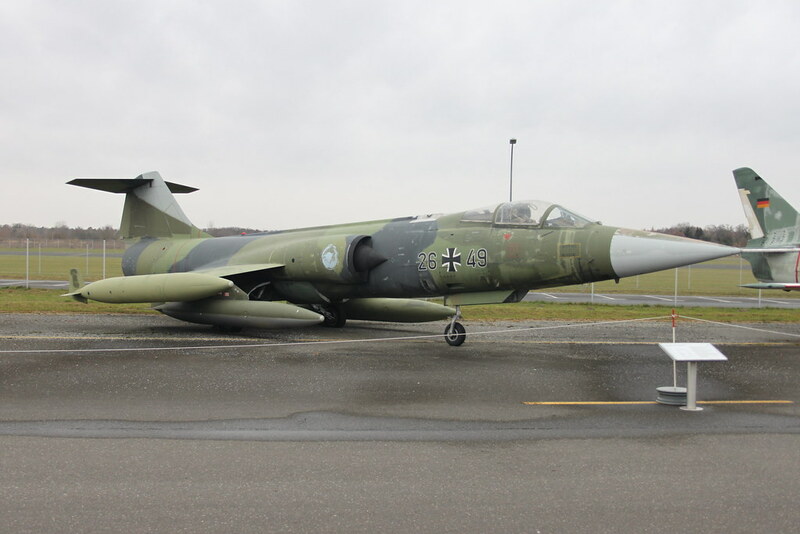 This one here is a single-seater F-114, also belonging to the German Luftwaffe. These here below are single-seater F-114s belonging to the USAF, equipped with air-to-air missiles for use as interceptors. About to settle in to watch,had a chuckle seeing the cross/swastiki/insigna after having learnt lately that both sides at start of ww1 had the same insigna so one had to change. Nice interview, thanks bsbray and Gary Heseltine. Interesting to know that about Roswell, and other good info too. Good interview, ta. Nice to hear a voice with your words also, Cheers Bsbray.